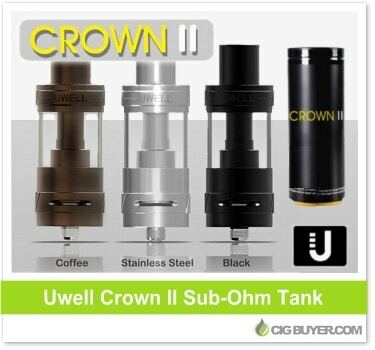 Undoubtedly one of the best performing sub-ohm tanks of 2015, the Uwell Crown Tank has been updated. The Uwell Crown 2 Tank has a new and improved chimney design that’s setup to produce even more flavor, with larger dual adjustable bottom airflow holes and a brand new coil platform that includes a conical-shaped positive connector for a smoother draw – available at 0.25, 0.5 and 0.8 ohms. The Crown II Tank has a larger 24mm diameter, more e-juice capacity (5ml) and is top or bottom filled with a delrin insulated drip tip.